Amazon Smart Search is the PUP that uses misleading techniques to prevent removal. Use Reimage to locate malicious components and get rid of them faster than with uninstall instructions. A full system scan blocks virus reappearance and prevents traffic to malicious domains. Amazon Smart Search functions as a browser extension and search engine which is specifically designed for Amazon customers. With the help of this browsing tool, netizens are promised to get a possibility to find wanted offers and products much faster. However, there is always another side of the deal which sometimes may seem to be too good to be true. Right after installing Amazon Smart Search on the system, it becomes clear that it is directly associated with Amazon Assistant. As a result, you may be soon be presented with multiple advertisements and pop-ups offering you to visit one or another web site or purchase products that you don't even need. Furthermore, you can be tricked into downloading these Amazon-related products via Java “Optional offer: Amazon Assistant” and similar pop-up ads. Credulous users may regard such add-ons as a legitimate ones and install them right away. Amazon Smart Search virus is compatible with all browsers but, most frequently, is compatible with Mozilla Firefox and Internet Explorer 8+. 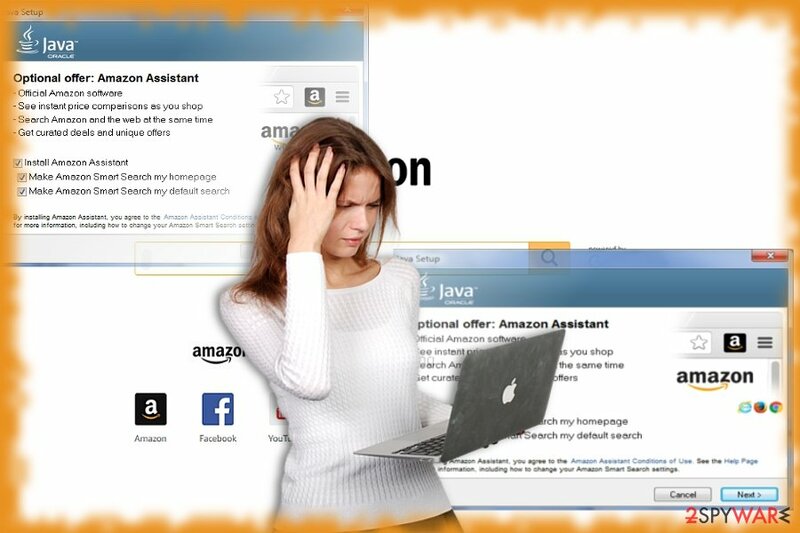 After being tricked into installing Amazon Smart Search virus, you may notice that your default search engine or the start page were set to http://www.amazon.com/gp/bit/amazonserp?tagbase=&tbrId=. If you are a regular Amazon customer, this search engine may seem useful. However, if you don't want to be bothered by commercial ads and redirects to sponsored websites, you should not fall for installing this search provider. If you accidentally installed this search tool and intend to remove Amazon Smart Search, make use of Reimage or Plumbytes Anti-MalwareMalwarebytes Malwarebytes. Amazon counts its successful years of existence already since 1994. It has grown into one of the largest online commerce markets through an astounding period of time. Staying up-to-date and sensitive to the demands of modern netizens, it has attracted thousands of customers and regular visitors. However, as a rule, what becomes popular online is soon taken advantage by scammers and spammers. Some time ago, crooks have managed to foist in a corrupted Amazon link among Google search results. Luckily, the malvertising campaign was soon terminated. Besides such cases, there are also numerous search engines with incorporated Amazon links. In this relation, this search engine may invoke impressions that it is legitimate tool supported by the company. However, Amazon Smart Search ads soon may spark doubts that there is something wrong with the browsing tool. Since the very company notes that it promotes third party services and links, you may soon get redirected to their sponsored domains. Amazon Smart Search redirect may not be such a big issue if not for this relation to already mentioned Amazon assistant virus. As a result, such redirects may lead you to a poorly protected website containing fraudulent elements. Amazon Smart Search reveals direct relation to Amazon Assistant virus. This search tool is promoted via several channels. If you regularly shop on Amazon or visit associated websites, you may be offered to install this search engine. Therefore, it is often labeled as PUP. It received attention due to its specific distribution channel. The search tool is promoted as an optional offer entitled as Amazon Assistant. Users often enable Java updates without taking a second look to offer optional programs. Likewise, they often end up installing unnecessary and sometimes even potentially malicious tools. Thus, if you notice such Java notification, remove the checkmarks from the pre-ticked boxes. If you enable “Amazon Smart Search hijack,” you may spend time on dealing with troublesome outcomes. You can remove Amazon Smart Search in two ways: either manually or automatically. If you opt for the former method, make sure you complete all steps precisely. In addition, you may need to review your browser extensions and uninstall the unknown or the ones appended without your direct consent. 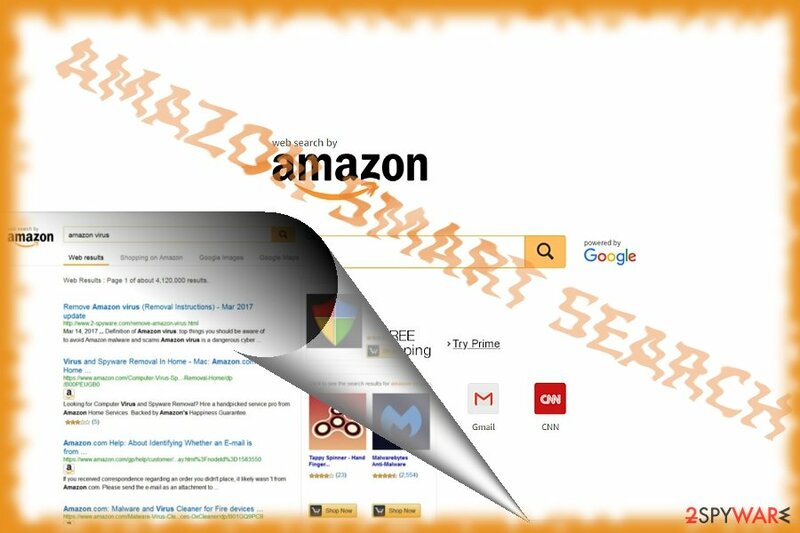 For faster Amazon Smart Search removal, you may let an anti-spyware tool get rid of the search tool. It will also scan the entire operating system and eliminate other possible threats. Here, look for Amazon Smart Search or any other recently installed suspicious programs. Wait until you see Applications folder and look for Amazon Smart Search or any other suspicious programs on it. Now right click on every of such entries and select Move to Trash. When in the new window, check Delete personal settings and select Reset again to complete Amazon Smart Search removal. Once these steps are finished, Amazon Smart Search should be removed from your Microsoft Edge browser. Since Firefox might be more targetted by this PUP, they are recommended to implement these instructions as well. Here, select Amazon Smart Search and other questionable plugins. Click Remove to delete these entries. Now you will see Reset Firefox to its default state message with Reset Firefox button. Click this button for several times and complete Amazon Smart Search removal. Here, select Amazon Smart Search and other malicious plugins and select trash icon to delete these entries. Click Reset to confirm this action and complete Amazon Smart Search removal. Here, select Extensions and look for Amazon Smart Search or other suspicious entries. Click on the Uninstall button to get rid each of them. Now you will see a detailed dialog window filled with reset options. All of those options are usually checked, but you can specify which of them you want to reset. Click the Reset button to complete Amazon Smart Search removal process. ^ Muse. Amazon Assistant... crapware at best?. AnandTech. Hardware News and Tech Reviews since 1997. ^ Paresh Dave. Amazon gets first dance with $1,000 share price. Los Angeles Times. california, National and world news. 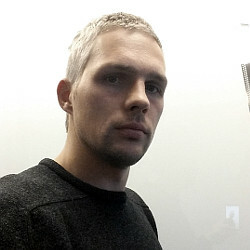 ^ Zack Whittaker. Google let scammers post a perfectly spoofed Amazon ad in its search results. ZDnet. News, reviews, analysis, comments. ^ Ashley Reynolds. Scam of the Week: Bogus email from Amazon. KY3. The Place To Be. ^ Geoffrey Manne. Guest column: Internet privacy is not dead. The Bulletin. Bend and Central Oregon News, Sports, Weather and Lifestyle. This entry was posted on 2019-04-01 at 10:21 and is filed under Adware, Viruses. You can quickly scan the QR code with your mobile device and have Amazon Smart Search manual removal instructions right in your pocket. How did you remove Amazon Smart Search?